The Yamaha CLP645BW offers the player a powerful sound combined with a superb wooden keyboard. Play along with rhythms to enjoy a new form of piano performance. The Yamaha CLP645BW is a new model introduced to the Clavinova range of digital pianos. The CLP645BW features the acclaimed NWX Natural Wood keyboard with escapement and synethic ebony and ivory keytops, wireless bluetooth audio connectivity and upgraded 60w amplification/speaker system to give a fuller bodied sound at lower volume levels. The CLP645BW has twice the number of speakers found in the lower range models and this gives a clearer, richer and more defined sound. The CLP645BW features a natural wood keyboard - a true wooden key just like an acoustic piano. 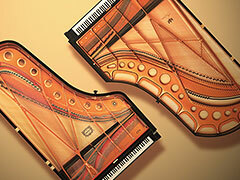 Just like acoustic pianos, the materials used for the CLP645BW keys are cut from wood that has been carefully selected and dried specifically for use in making musical instruments. Click the button below to add the Yamaha CLP645BW Black Walnut Clavinova Digital Piano to your wish list.